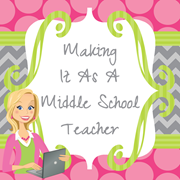 Making It As A Middle School Teacher: Are You Going to Hit the Teacher Appreciation Jackpot Sunday? 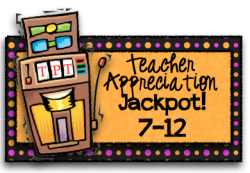 Are You Going to Hit the Teacher Appreciation Jackpot Sunday? By now, if you follow many blogs at all, I'm sure you've seen us announcing the Teacher Appreciation Jackpot set for Sunday, May 6th! 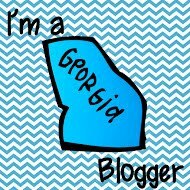 This "blog hop" includes over 130 bloggers! Remember...you will be able to download over an estimated $500 worth of teacher resources that day!!! Every resource will be valued at between $3 and $8. We are working behind the scenes determining exactly which resource each of us will provide and the exact amount of the prizes will be posted on Saturday, May 5th...so be on the look-out for that! With so many bloggers joining together for this, the event is broken down into 3 smaller, grade-level bands. I'm taking part in the Grade 7 - 12 event. This is being coordinated by Adrianne Meldrum of The Tutor House. In the meantime, look at the awesome blogs in the Link-Up below! Visit them, follow them, stalk them, whatever your pleasure. These are the bloggers who have joined together for the Grade 7 - 12 event!! !